Cast iron stove vent free gas stove. 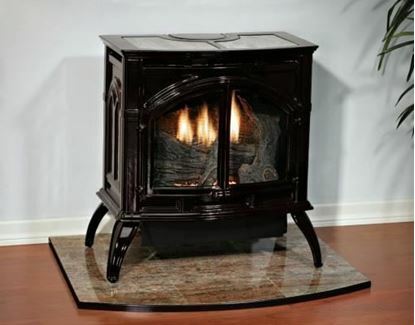 Bring the warmth and beauty of White Mountain Hearth into your home with a Empire cast iron stove. Vent free Empire cast iron stoves come standard with Empire's Contour burner system. The Contour burner features precision-port technology to produce vibrant flames. Topped off with the hand-painted ceramic fiber log set and glowing embers, the effect is as realistic as a gas-fired stove gets - guaranteed to keep you and your guests mesmerized for hours. Vent free gas stove.